Illuminated Manuscript, Duke Albrecht's Table of Christian Faith (Winter Part), The Symbols of the Four Evangelists, Walters Art Museum Ms. W.171, fol. 156r, originally uploaded by Walters Art Museum Illuminated Manuscripts. This illuminated manuscript is a document of the first importance in the history of Dutch manuscript illumination, and it contains an important medieval Dutch devotional text. The Tafel van den Kersten Ghelove is a compendium of Christian knowledge written by a learned Dominican, Dirc van Delf. The text is in two parts, one for winter, and one for summer. This manuscript is of the winter part, and it is incomplete, omitting the prologue and chapters 13,14, and 35-72. 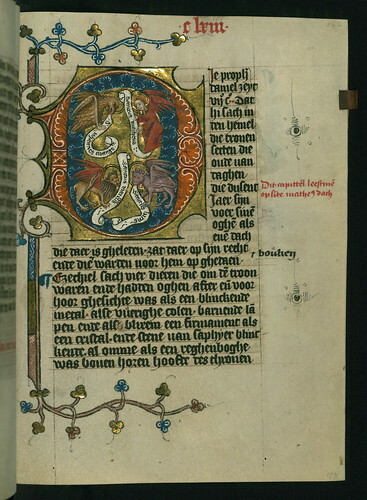 The arms of the Bavarian Counts of Holland and the kneeling owner on fol. 1 indicate that this manuscript was the actual copy prepared for the dedicatee of the text, Albrecht of Bavaria, Count of Holland, from the original text of his chaplain, and is therefore to be dated to 1404 at the latest, when Albrecht died. The manuscript consists of 165 folios and contains 35 historiated initials. good the ability to enjoy video clip & Film streaming Terrarium TV to click on downloaded and install Apk file best.